Organic unprocessed virgin coconut oil is unlike any other oil in the world. Coconut oil functions as both a food and a natural medicine, and can be applied externally as well as ingested. Coconut oil contains no preservatives, no harmful chemicals, and yet in spite of this, it has an almost unlimited natural shelf life, requiring no refrigeration for storage. Coconut oil has a bevy of beneficial medicinal properties, the most impressive of which would be its effect on the memory. It has been shown to halt the progress of both dementia and Alzheimer's disease, as well as slowly reversing them. Just two to three tablespoons of coconut oil a day mixed in with food, a hot beverage, or simply eaten directly out of the jar and you will start seeing results–in some cases within as little as 24 hours. Coconut oil is also excellent for weight loss since it cuts your appetite, gives you energy, and raises your metabolic rate by 50 percent for the entire day. Adding just 1 teaspoonful to tea or coffee in the morning can prevent that energy slump in the afternoon. Due to coconut oil's molecular structure, it's digested and absorbed at a very high rate. A bonus of this increased absorption rate is that any proteins, vitamins and minerals consumed along with the oil are absorbed at a higher rate as well.The energy released with coconut oil is not the short, jittery burst of energy that you find with stimulants like caffeine, but a long surge of energy that kicks in about an hour after ingestion, and lasts throughout the better part of the day. 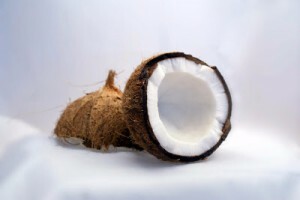 Fueled by the easily available energy provided by the coconut oil, the body doesn't need to tap into its own energy reserves in muscle tissue. So, it's great for endurance athletes and body builders. Coconut oil also prevents the breakdown and loss of muscle tissue. Additionally, for building muscle mass coconut oil increases one's calorie intake without having to ingest a large mass of food. I love what coconut oil does for your skin. Unlike other oils, it's totally absorbed, leaving no oily residue behind. Whether it's on the skin or eaten, it kills bacteria, fungi, and viruses. When used as a moisturizer, it leaves your skin soft, smooth, and of course, moisturized. It's also great for fixing fine lines and dry patches on elbows and knees, and is an excellent treatment for acne, psoriasis, and eczema. But wait, there's more: coconut oil does amazing things for the hair. It works wonders for normal hair, split ends, damaged hair, and promotes healthy hair growth. It produces particularly amazing results with exceptionally frizzy or unruly hair. When it comes to choosing a specific brand of coconut oil, I've tried about five different brands, with my personal favorite being the Viva Labs Organic Extra Virgin Coconut Oil. Viva Labs brand coconut oil has an excellent taste and smell, provides me with consistently more energy than the other brands, and also gives me a slight amount of euphoria when combined with an herb called ashwagandha. Honestly, you really can't go wrong with the majority of coconut oil brands, but when I run out of Viva, I really miss it. In summation, coconut oil is really a miracle food that can be extremely beneficial when added to anybody's diet, whether or not they suffer from Alzheimer's disease, eczema, or just split ends. Coconut oil is inexpensive, all natural, requires little to no upkeep when it comes to preservation, and is widely available everywhere. Fife, N.D., Bruce. Coconut Cures: Preventing and Treating Common Health Problems with Coconut. Colorado Springs: Piccadilly Books, Ltd., 2005. Print. Newport, M.S., Mary T. Alzheimer's Disease: What If There Was a Cure?. Laguna Beach: Basic Health Publications, Inc., 2011. Print.